Over the past 48 hours you will have noticed a few changes to the Realestate.co.nz website. We have released a whole new platform, a ground-up rebuild that leaves the old site and focuses us to the future of delivering the best property finding experience in NZ. The process to this day began last year with conversations. Conversation grew into discussions and discussions grew into concepts. We heard loud and clear from our current users of the site, and those who did not use it, what they liked, what they did not like and what they wished someone would give them – the latter component is so key, and yet at the same time so elusive as to be able to easily define what people really want when sometimes even they cannot articulate it. We also took the opportunity to review the global leaders in real estate online solutions across the world, sites like Realestate.com.au in Australia, Rightmove in the UK and in the US Trulia and Zillow. These would be the sites that guided (but were not allowed to constrain) our thoughts and ideas. Zipping ahead to today. We have built a new website that is different, certainly that is clear from some of the flow of emails received so far, as clearly people are not accustomed to change, however the feedback has been balanced. The essential focus of the new site is to allow anyone to use the site to easily accomplish two related but very different tasks – browsing and researching. These are two behaviours of real estate online search that are critical to understand in order for our site to deliver a unique and valuable experience. This is the start of any property buying (or renting experience) – it is typified by a “lean back” mode in the chair to view the screen – here the task is to chose a location and then browse through images in a large format in which property images can be scanned. This is achieved in the search result page for any location. Any property listing can be assessed by flicking through the portfolio of images without ever leaving the search results thereby ensuring you have your options in front of you. A likely task before even scanning these images is the filtering of the properties in the area. This is done now using the right hand navigation with sliders to tightly define the key metrics of price, size of property. This filtering typically allows the user to refine the shortlist to a couple of dozen – ready for research. The great capability of the new site is that adjustments to these sliders does not require the “update” button – rather updates are made dynamically as you make a change allowing you to refine from 400 properties down to 20. This stage in the process is far more investigative and is typified by a “lean forward” mode in the chair closer to the computer terminal. At this stage it is all about capturing your favourites and this requires you to set up your “My Property” feature on the site. Doing this ensures that your properties and saved searches are always accessible from any computer. Storing your favorites from the search results then allows you to view each property in detail on the listing page. This presentation is all about big images and rich content, both from the listing agents, as well as location based data such as Google maps and Zoodle property information. This is the stage when you can start to enquire about the property or plan to view open homes all of which are accessible from that listing page. There is much we have learned over the past year that we have yet to implement, that is what will provide us with a great roll out of new functionality in the coming months, however it was important to get the new site live and bedded in – this does sometimes take a few days, and consequentially some issues, so we would ask for your patience. Of course the other major change you will be aware of is the fact that the new Realestate.co.nz only features residential and lifestyle properties for sale or rent. The comprehensive content of commercial properties are now found on Prime Commercial, with businesses for sale on Prime Business and the agricultural sectors served by nzFarms. This provides an introduction to the new site – future articles will highlight some of the key features of the site. We just want to let you know that we will be undertaking significant work on the realestate.co.nz website this weekend. This work is an exciting development of the website. We need to shut off the site from 9am on Sunday morning (2nd May) – we should be back online again around lunchtime. I really hope this is not inconvenient for you – it does however give you a chance to have a long leisurely lie-in and possibly breakfast in bed! If you want to be kept informed you can follow us on our Twitter account @realestateconz we will be tweeting progress. Naturally we have lots of exciting developments to share with you once we go live so stop by later on Sunday! I have today personally received 3 complaints in regard to our newly released websites – the common thread was that these sites were broken! – the tabs did not work and the search was unusable. Not good news to any website business. The question I had to ask myself and the rest of the team was – how could it be that we could get these 3 distinct and specific issues when thousands of sessions were being served in the past 24hrs with no issue? Further investigation revealed the common theme – Internet Explorer 6. Here comes the brutal truth – our new website architecture does not support and will not support Internet Explorer 6 – sorry! The constant challenge that faces every web based company is what browser to support. The web has been in operation since the very early 90’s – at that time Netscape was the king of the hill, over the years new and improved web browsers have been released. Each new release bringing enhanced user benefits to speed up and improve the experience of using the web. The challenge in building a website is to be able to ensure the majority of users can enjoy the features and benefits of the website without having to compromise to suit everybody. There is a very clear and trusted rule which I believe is appropriate to apply in such matters – that rule is “Support to N-1”. This translated means that you build a website which is compatible with the latest version of all available web browsers and also in addition to support the last version. In the case of Microsoft Internet Explorer, the current version is IE8, so we built the new site to run on IE8 and the predecessor IE7. We did not build it to be compatible with IE6. This rule is consistently applied to other web browsers such as Firefox, Safari, Chrome, Opera etc. The big problem is that the rule of “n-1” for all other browsers is not a problem as most users of non IE browsers tend to upgrade regularly taking advantage of security enhancements and feature improvements. It is also important to remind people – browsers are free to download. When it comes to IE6 however the problem we and many thousands of web companies across the world face is that IE6 was probably the most widely used web browser, as it was packaged with the hugely successful Microsoft Windows XP and many companies chose not to upgrade to Windows Vista in early 2007 and therefore have not chosen to upgrade to the later version of IE7 or IE8. I don’t need to labour the point, but if you are using IE6 I would recommend reading this Wikipedia page on IE6 – it states that the IE6 browser is “widely derided for its security issues and lack of support for modern web standards, making frequent appearances in “worst tech products of all time” lists, with some publications labeling it as the “least secure software on the planet.” It is a fact that the French and German governments have advised their citizens not to use IE6. It is also important to remember than IE6 was released in 2001 – it is 9 year old technology which in web years is close to half a century! So whilst I am sorry if you are experiencing issues in viewing these new websites. My recommendation would be to download IE8 – it only takes a few minutes, but the value to you will be immeasurable not least in knowing that the security of your internet usage will be many hundreds of times better and your enjoyment of the new Realestate.co.nz websites will be enhanced. Realestate.co.nz as a company today embarked on a major strategic move designed to cement its position as the most valued and comprehensive source for real estate information in New Zealand. Since the launch of the website of realestate.co.nz back in August 2006, the website has maintained a leadership in content, supported by its ownership within the industry; the single site has hosted over 1 million listings spanning the wide diversity of real estate from rental properties to businesses for sale, from high country farms to lifestyle properties and from townhouses to retail premises to lease. Today the site hosts over 120,000 listings and regularly receives over 26,000 unique visitors everyday. Whilst the site provides great capability to find all sorts of real estate we have never assumed that it was the best solution of how to find the best property. In business there is always a need to constantly want to strive to find a better solution. Solutions come from insights and through much of 2009 we talked with consumers, as users of the site and also our real estate customers, to better understand what they felt was important in a tool to assist them. From the standpoint of the homeowner – how to more easily find listings; from agents and offices – how better to display and feature listings. These insights lead us to develop a new website structure, and not just one website. As one of the key insights we learned, was that there was a desire to separate the different content of listings – separating commercial property to buy or lease, from businesses for sale, separate from farms; all separate from residential property to buy or rent. Our solutions launched today is a family of websites – 3 brand new names and websites to provide the industry and consumers of New Zealand with the most comprehensive focused means of easily finding the property or business to suit their needs. Prime Commercial – the new brand for commercial property showcasing the most comprehensive collection of properties for sale or lease across NZ. At this time 25,322 listings are featured on this website from over 94% of all licensed real estate offices – this site has more than 20% more content than any other website featuring commercial property. Whether you want to find leasehold property on the North Shore or commercial land in Nelson this site has it all. Prime Business – the new brand for the specialist area of business broking, this site provides the most comprehensive selection of businesses for sale anywhere in NZ. At this time a total of 3,768 businesses for sale are featured on the website – more than double the content of any other website in NZ featuring businesses for sale. Whether you want to find a new franchise opportunity in the Canterbury region or a manufacturing company in the Hawkes Bay this site has it all. nzFarms – the new brand for the rural sector of the NZ market, this website provides the most comprehensive slection of farms, agricultural land as well as lifestyle properties for sale across the whole of the country. At this time a total of 7,917 farms and agricultural businesses are featured on the site together with 11,809 lifestyle properties. This comprehensive portfolio of rural NZ properties and agricultural businesses is more than 50% more than any other website featuring such content. Whether you want to find a dairy farm in the Waikato or horticulture in Central Otago this site has it all. Unconditional goes out on its own! Social media was a seldom used NZ phrase back in 2007 – especially in the context of real estate. That was when the first tentative steps were made by Realestate.co.nz to embrace the emergence of social media – creating a single blog to speak about the property market and the real estate industry, coupled with a free blogging platform for all real estate agents. Fast forward 2 years and with more than 25,000 unique visitors per month logging on to read the more than 300 articles posted on the Unconditional blog and the many hundreds of articles posted across the more than 100 blogs started on the Voices platform, it is clear that social media has come of age in the real estate industry. It is for this reason that we have decided that now is the time for Unconditional (the blog) and Voices (the blogging platform) to be launched on to its own platform separate from Realestate.co.nz to allow it to be seen for what it has truly become – a destination that truly can be seen as a place to find out exactly “what is going on in real estate”. As from today Unconditional becomes a comprehensive web source of everything about the real estate market – written by people in the industry speaking openly, honestly and transparently about this industry, mixed with great data and reports. The Unconditional blog – As was envisaged when this blog was started back in November 2007, this blog has become a valuable source of information, insight and debate. At times it has incurred the wrath of some in the real estate industry as it has striven to establish a honest and transparent commentary on what has been an incredibly turbulent time for the property market and the real estate industry at large. It intends to go on highlighting information, statistics and commentary on the market both here in NZ and overseas as well as the odd piece of light relied from the sometimes dry data. The NZ Property report – This monthly report produced from the data of the Realestate.co.nz website has fast become, since launching in April, a valuable complement to the established monthly data. The report track new listings, asking price expectations and inventory levels on the market. The Property Dashboard – This section provides a clear view on what are judged to be the key stats on the property market – selling price, measured as a stratified price index, inventory levels of property on the market and monthly volume sales. These charts are constantly updated to provide a comprehensive and timely view of the property market. Agent Voices – This platform has now been given a greater visibility for those active real estate bloggers who are keen to share their eclectic thoughts, insights and opinions on the market in their local area. There are over 50 active bloggers profiled on the Voices section of the site and these can now be viewed based on their geographical location. The heart of Unconditional is the principle of social media – building and engaging in a conversation – an open, honest and transparent conversation, so please have a read and write a comment. There is much to share and much to learn so please let us (collectively) know what you think! A number of recent search queries on this blog have originated from the question “what are the latest numbers for web traffic on real estate websites?” – so in a spirit of openness and transparency, here are the latest stats for August from Nielsen Online. In the month of August a total of 1,489,294 unique browsers visited at least one of the real estate website tracked by Nielsen during the month. That is up 17% on a year ago and now represents the highest ever month. The previous record was just last month with 1,415,803. As can be seen from the chart below the rise of real estate web traffic has been steady and progressive over the past 4 year when back then 500,000 unique browsers was a record. Whilst the traffic may have grown 3 fold over the past 4 years the sales and buyer demand has not grown anything like that level. This demonstrates firstly the growing dominance of the web as the most utilised and valued source of real estate information, but also that online browsing of real estate listings – and especially those of appealing lifestyle property is a very active kiwi pastime! In terms of which websites are being viewed the table below charts the top 10 websites on the same metric of total unique browsers in the month of August 2009. What is noticable from the table is the growing polarisation of audience – those property portals (realestate.co.nz and trade me property) are stretching the lead. This is a function of the appeal of their respective offerings – in the case of realestate.co.nz, the most comprehensive content and in the case of trade me property, private sellers. A final metric of the market for online real estate websites is the relative growth on a year-on-year basis. The total audience of all real estate websites is up 17% – indiviudally the growth of individual website from within the top 10 in most cases exceeds that growth further demonstrating the polarisation to the major top sites. Naturally we are delighted to see that realestate.co.nz is up a staggering 50% in a year delivering close to 400,000 unique browsers in the month of keen property searchers both here in NZ and from overseas. Open home times – one site has it all! It’s as much a part of the NZ property market as street signs and auctions! – the open home is the efficient and effective tool to enable agents to promote their clients homes and in doing so evaluate the interest in the property from prospective buyers. However whilst there is no doubt that open homes remain a popular weekend activity for inquisitive property seekers – the process of planning an open home schedule has been up until now a challenging task requiring a degree in project management and a well structured Gant chart! Well now just as property search was revolutionised by the web, so organising open home is equally being revolutionised by this website. As of now anyone can search on any area of the country and select just the properties for which there is an open home planned in the next 7 days. No more cutting up the local newspaper or property magazine and gluing pieces of paper into a timetable – the web can do it all for you. Here’s how. Search box – this box now features a tick box, select this and you will just see the open homes featured on the site today with scheduled times in the next 7 days. At this time there are over 2,000 scheduled in the next week – that should keep you busy. As a point of note as with all listings we rely on the individual agents to provide the details to us of the open homes as well as their company data integration system. With this feature only launched today we will see the number of listings featuring open home details grow significantly over the coming weeks. When you do any search for property at region, district or suburb level, whether it be for an apartment, house or unit, 3 bedroom, 2 bedroom etc you can filter the result by ticking the “only show open homes” tick box at the top of the filter. So for example if you were interested in looking for a home with 2 or more bedrooms in Taradale in the Hawkes Bay and you were looking to spend between $400,000 and $500,000, then you would have a choice of 16 listings to tempt you – of those 4 of them have open homes times scheduled this weekend. Now having selected your chosen area and refined search if you save that search by registering your selection as part of “My Property” you will not only be sent notification emails of new listings that match your search but each Friday we will send you (your choose) an email which details in chronological order all the listings with open homes scheduled in the coming week. A great tool to making the planning of open home visits so much easier. Never fear as to being kept informed of the status of open homes as the data transfer between each office and our database is very frequent ensuring that if for any reason an open home is cancelled or rescheduled then you can with this weekly email or by checking before you set off review the status of all open homes. Best of all for every open home you are interested in viewing you can from the website download an reminder to your iCalendar or vCalendar which is compatible with most calendar based applications allowing you to take the details of each open home with you on your phone, PDA or iPhone. As ever with all facilities on realestate.co.nz you know you are always seeing the most comprehensive selection of real estate listings of any website. There is no other website in NZ that has such a comprehensive selection of properties of all types. As at this time we have over 111,000 listings of which over 42,000 are homes for sale, 10,000 are lifestyle properties and over 17,000 residential sections. We have a subscriber base of over 93% of all licensed real estate offices and thereby are displaying the most comprehensive view of the market. Expect more from us in the coming months as more and more open home details will be presented on the site. We have plans for further enhancements with mapping of open homes and in time GPS driving details – technology offers such great opportunities – all designed to help you make better use of your time in viewing those prospective new homes. Happy open home viewing! The subject of property statistics attracts a large amount of comment and in turn opinion. This is in large part due to the importance to which people nowadays ascribe to these stats as indicators of the health of the market and in some ways as a surrogate of consumer sentiment: house prices rising – consumer sentiment rises; house price falls – consumer sentiment falls. When it comes to the total number of property sales and total number of listings of property on the market – there is no debate, the numbers are clear unequivocal and objective; however comment on a median price or an average price and the waters will part and the two opposing sides will commence their passionate debate as to the merits of each. In putting together the recent first edition of the NZ Property Report we thought long and hard about the judgement of describing the asking price as a median or average. Whilst the definitions of each are well documented they do veer towards the academic, so in simple terms the merits of each can be described as such. The average or mean price is just that the total of all sales divided by the number of sales. However its major failing is inherent in the diversity of property for sale in NZ – from $150,000 leasehold units to $15m luxury properties – each can when the sample size is of the order of 5,000 to 10,000 properties, cause significant swings in the final average. The median price is the mid-point price of a range ranked from smallest to largest – this has the benefits of effectively ignoring the extreme variances of sales highlighted above. However there is a flaw in median pricing which has been highlighted most conspicuously when it comes to the asking price statistic and that is something called “lumpy data”. The fact is property marketed is usually priced increments of between $10,000 and $50,000 – typically you will find an asking price of $320,000 or $350,000 seldom will an asking price be $332,567! – this lumpiness can and does lead to the occurrence of the median moving by as much as $20,000 for the sake of 1 extra listing. This dilemma has lead us to seek the advice from academics and economists who are as we have found most interested in this recent lead indicator data of asking price. From these discussions has emerged a recommendation for a new measure of asking prices for properties be adopted. This new measure is called a ‘truncated mean‘. 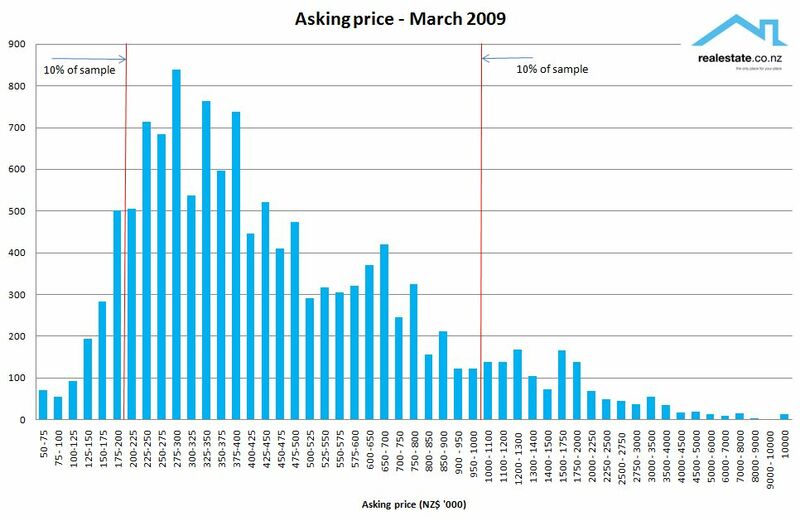 The chart details the distribution of the asking price of the 13,284 listings which were added to the website in March 2009. 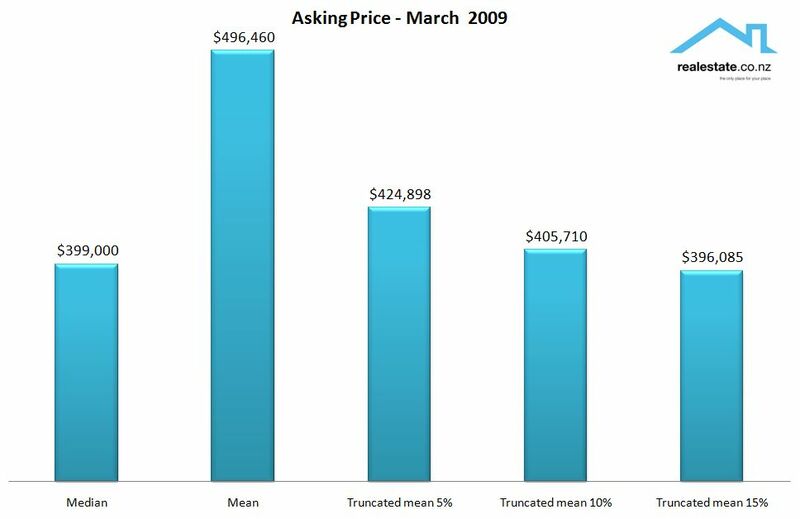 The application of a truncated mean at 10% results in properties priced with an asking price of less than $200,000 and property with an asking price of over $1m are excluded ( the actual cut off point is not so clear cut but for explanation these points are used). The important point is that the 10% exclusion point at the ends of the data ensure that as prices moves so the sample is based on the most representative 80% of the market. The choice of 10% as opposed to 5% or 15% both of which were investigated is as a result of detailed analysis of the data set going back to 2007. The rationale is that the more the extremes are removed the more the truncated mean approximates to the true average asking price for the majority of property however as ever there are diminishing returns. At 5% there are still too many extreme priced properties, equally at 15% the data set is significantly reduced by 30%. That is why 10% is judged to be appropriate given the scale of the data set and the makeup of the listings. To provide some insight into the impact of this new measure as opposed to the existing measures the chart below provides some clarity. A key test of this new measure is shown when hypothetically some changes are made to the base data as a function of extreme sales results. Scenario 2 – within the data sample of 13,284 listings just 5 new listings are added, all of which are priced below $200,000. The result is that the median price falls from $399,000 to $395,000 – no change in the truncated prices and the average price falls very slightly by $200. These scenarios highlight the vulnerabilty of the data of asking price to movements in listing data sets that are in many way unique to asking price data, that is why with the new NZ Property Report to be released on the 1st of May and all subsequent NZ Property Reports will utilise this new truncated mean to present the asking price data, both current and retrospectively. Was that house sold or withdrawn? The realestate.co.nz website is a medium for the advertising of properties (commercial and residential) for sale or rent – that is the principle and since the start of the site back in 2006 we have actively discouraged (physically removed) any listings from agents that try to use the service to “advertise” a SOLD property in an effort to secure new listings. This principle has been adopted to support what is in our belief the fact that buyers only want to see listings in the site that are genuinely “on the market”. Now a smart real estate professional in Hamilton by the name of Greig Metcalfe posed the question to me the other day of “how do people know what happened to a listing when suddenly it disappears from the site whilst they have been tracking it?” – he rightly went on to say that people may wonder – was it withdrawn?, did it get lost and slip off some database? or was it actually sold? This got me thinking and in the case of Greig – got him blogging – why not seek input from the public as property seekers and the industry to share their thoughts. So here is a concept to discuss – something I would really appreciate some feedback on to generate some valuable discussion. To help clarify exactly what this concept is let’s say we, when notified by the listing agent that the property has sold (gone unconditional) we mark the listing with say a red banner as per this mockup and have it on the site for a period of 5 days after which it disappears. The listing will still appear in the search results in exactly the same position based on listing date. Zoodle – it’s all about property! That is the strap line to the new property information website officially launched today and in someways that is all that needs to be said, it is a website all about property – information for over 1.5 million homes in NZ surpassing 30 million pages of information. We have built in partnership with Terralink a website which we feel will provide much needed information in an easily accessible form to enable all parties involved in the property market to make better informed decisions. The individual sources of data that combine to make Zoodle such a rich and rewarding website experience have been accessible individually for a long time, it is only the statistical data from realestate.co.nz which is new to the market. What is significant is the way in which data has been stitched together through the website to provide a very clear picture of a property – any property in NZ. Zoodle is not just about properties – we have built rich information around suburbs and communities so people can be better informed as to the facilities and amenities that make up a local community. We are keen to embrace the contribution of others in profiling suburbs. To start with we have encouraged local real estate agents to share with us their feel for the communities in which they work. This will be developed later on into a richer user generated content section of the site, enabling people to feel a part of the site. Zoodle – helping you through every step of the property buying process.